On this Veterans Day words cannot express the gratitude I have for the sacrifices you have made for God and country! I also recognize the great sacrifice your loved ones have made when you were gone, most likely often, when you were out protecting our country fighting for our freedom! I also think of the numerous soldiers who have lost their lives in battle and the families that have been left behind to mourn their loss. 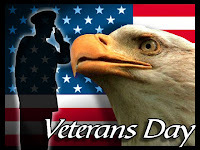 Simple words cannot truly express the gratitude I have for every military personnel past, present, and future! Thank you for sacrifice! I pray that we never take you for granted! The following is an American Military Tribute through a song named Unknown by David Harsh. Please take a few moments to view and listen to this great tribute! Note: You may need to pause the music/tunes on this blog by scrolling down the right hand side until you see the Tunes/Music Player and press pause so you can hear the introduction and music without interruption.